WineRocks Capt. Quirk – DFV WineRocks! If you’re looking for a cover band that’s a little bit different from the rest, you’re looking for Capt. Quirk. Formed in 2014, Capt. Quirk features several long-time area musicians who have seen more than their share of crowds over the years. Capt. 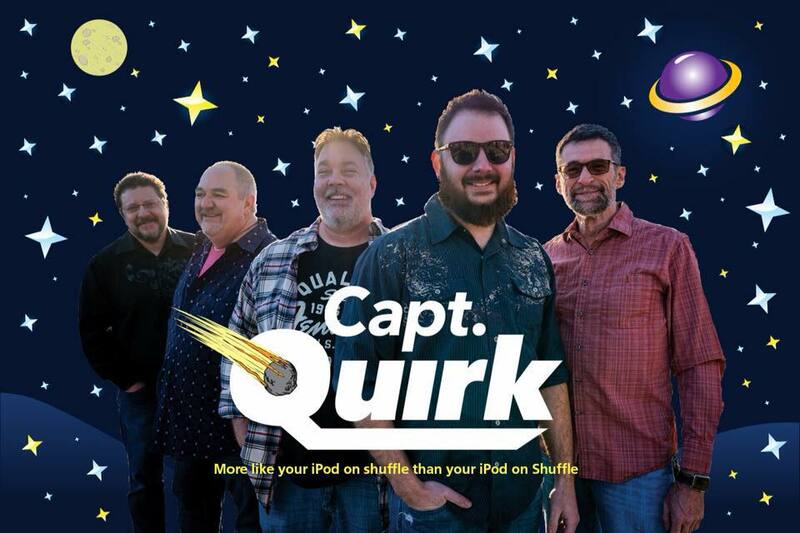 Quirk describes their mix of tunes as ‘more like your ipod on shuffle than your ipod on shuffle’. They will go from Foreigner to Marc Broussard to Chris Stapleton in the same set. The band focuses on good songs, no matter where they came from. To that end, you’ll hear tunes you know from bands you love (You Got That Right by Lynyrd Skynrd), and tunes from artists you don’t know (Paulo Mendonca, Big Hat). But one thing shines through…the love these 5 guys have for music, for playing together with each other, and the passion they have for performing live. The pedigree of musicianship in Capt. Quirk is extremely strong. Jeff Brockamp (Guitar, Vocals) and Bret Johnson (Bass, Vocals) have been playing together since 1994 in The Willies, BubbleGum Jack, The Jigawatts, and now Capt. Quirk. Kevin Smith (Guitar, Vocals) has been featured in Gypsy Road, Jera And The Absoluts, Danny Everhart and with Steve Correll (drums, vocals) in Porch Swing Therapy and John Brillhart’s Down Homies. Steve also played with many bands in South Central Illinois and Indiana plus local Central Illinois bands Short Fuse and Square Of The Roots. Jeff Logsdon (guitar, keys, banjo, mandolin) counts Sylent Tyger, Bubblegum Jack, Spring Creek Station and Matt Miller among his many playing credits. With all this incredible playing experience in one nice tidy little package, what can you expect out of a Capt. Quirk show? You can expect that the music you hear will be performed passionately and with soul. These songs have been hand picked by us to be songs that we enjoy playing, so it’s going to show in our playing, and especially on our faces. And that’s the only way we’d have it…because if it’s showing that we love what we do on our faces, it’s going to be contagious and make your face smile. And make your feet tap. And make your ears love what you’re hearing. And that’s why we’ve all been doing this as long as we have, and will continue to do until we physically can’t.